The story of my life was illumined by the life that shines from Jesus’ story. The repetition of that story across the days of two years had provided points in time that opened into relationship with other people and with God. It had invited me to know myself more truthfully. It had also graced me with the assurance that I am known, not from outside time but within it (86). I like this idea a lot–that through this shared and ever-repeating calendar, we are “known.” I understand it like this: that my experiences, though unique, can be understood or framed through the lens of a foundational story. In this case, the story of Jesus of Nazareth. Now, this works because I am drawn to many aspects of the Jesus story. Whether I am hearing about young Mary’s leap of faith at the Annunciation or the women trembling in fear before the empty tomb, there is almost always a hook that catches me and connects to my own experience. For me, these hooks are emotional. I identify with the characters–their actions, their questions, their fears and hopes. Now, I’m obviously less compelled by the Jesus story when it comes with an interpretation that is offensive or alienating to me. For example, the season of Lent is linked with the theme of repentance. I can get behind that, until I am asked to repent for things I don’t understand as “sinful.” Then I start tuning out big time. I trust I’m not alone in that! This highlights what is, for me, one of the deepest mysteries of the Christian faith. When we observe the traditional Western Christian calendar (as we do at First Church), we synchronize ourselves across generations and cultures to other communities of faith. And it would be naive to assume that those other Christian communities understand the story the way we do. (Indeed, it is futile to speak of “we” here, as First Church itself is home to many theological views!) Our disagreements about the Jesus story can be painful, with tragic outcomes. Yet we still gather together and follow this calendar, echoing other churches around the world and through time. I like to imagine how God would make sense of this scene: diverse people going through similar motions, lifting up similar words and images, but with different explanations and intentions for doing so. What would the God’s-eye perspective be? I am reminded of the UCC motto: “That they may all be one” (John 17:21). 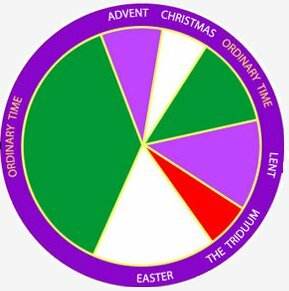 Maybe, through our experience of the liturgical year, we are more “one” body than we know or would even care to admit!